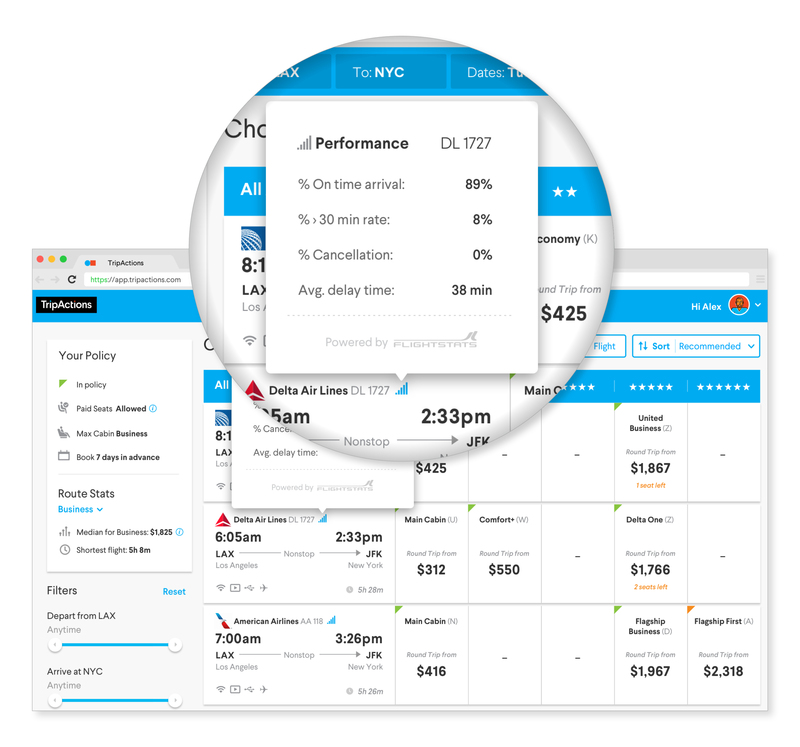 Since TripActions was first founded nearly 3.5 years ago, we’ve been continuously learning and iterating based on user feedback to create the best traveler and company experience available in business travel. Our focus has always been to maximize choice for travelers in partnership with our suppliers, to make booking trips fast and easy, and to build a robust business travel solution that gives companies everything they need to manage a successful travel program. Over the course of the last year, we’ve heard loud and clear from our customers and airline partners that there’s tremendous opportunity for innovation in the flight shopping and booking experience. Travelers want more choice and insight into what they’re booking, travel managers want their travelers to understand company policy, and airlines want the significant diversity of offerings they’ve introduced to be accurately represented in third party booking tools. Corporate travel solutions simply haven’t stepped up to the plate, leaving business travelers confused about what they’re booking and if that option is actually in policy. Does that flight offer lie-flat business class? Is that seat within my company’s policy? And will I have wifi on board? Our customers and partners deserve better. So, for the last 6 months, we’ve invested thousands of hours of research and development work to build a radically innovative flight shopping experience unrestrained by industry norms or legacy infrastructure. 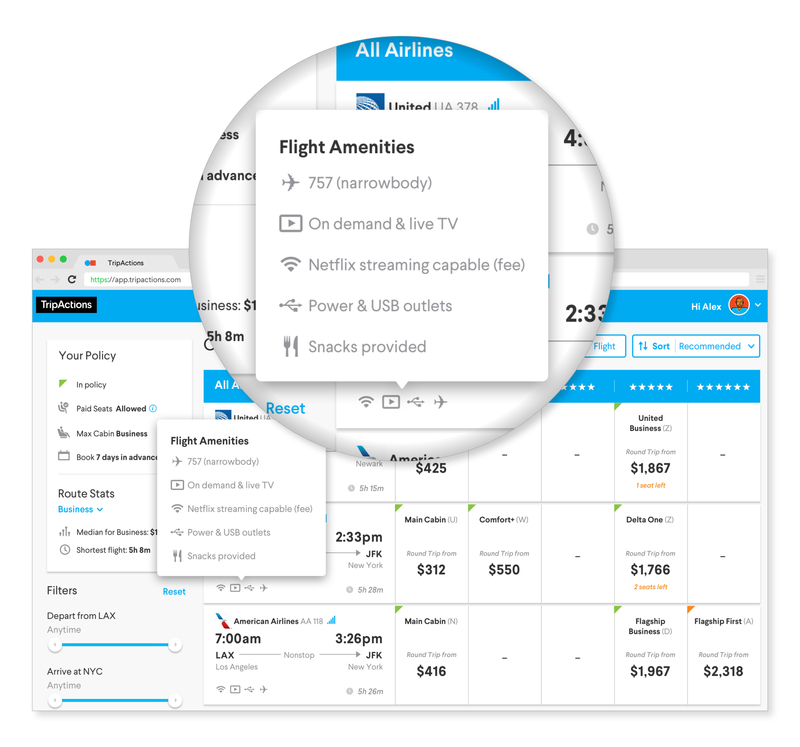 Simply stated, we set out to build the best third party flight booking experience on the planet. 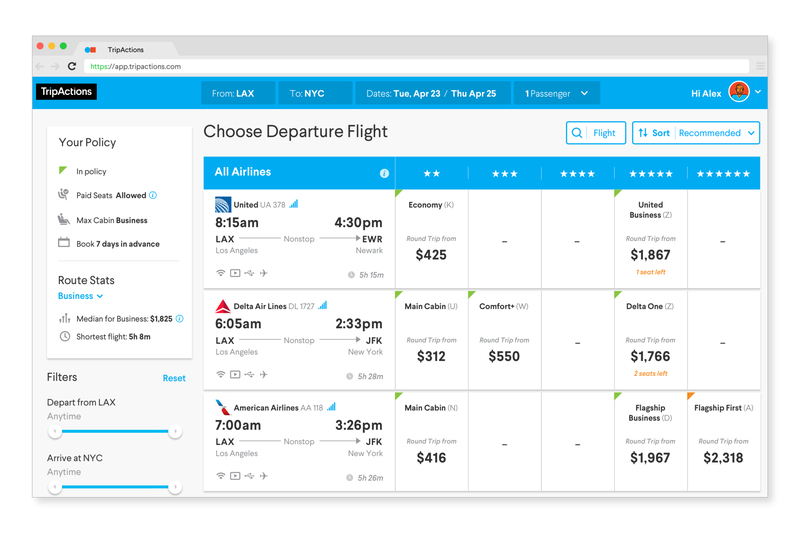 Today the entire TripActions team is proud to unveil our groundbreaking new flight storefront which sets a new standard for user experience in business travel by giving travelers the information they need to book their flights, including a better display of company policy. This new flight booking experience was developed in close collaboration with industry association ATPCO as well as with leading airlines who view the new booking interface as a major step forward for the industry. “We’re looking at every aspect of our business to provide a great experience for our customers. With an expansive route network, updated products and making it easier to compare these offerings when they’re booking flights, we want customers to feel the care and commitment we put into traveling on United every day,” said Tye Radcliffe, Director, Distribution at United Airlines. 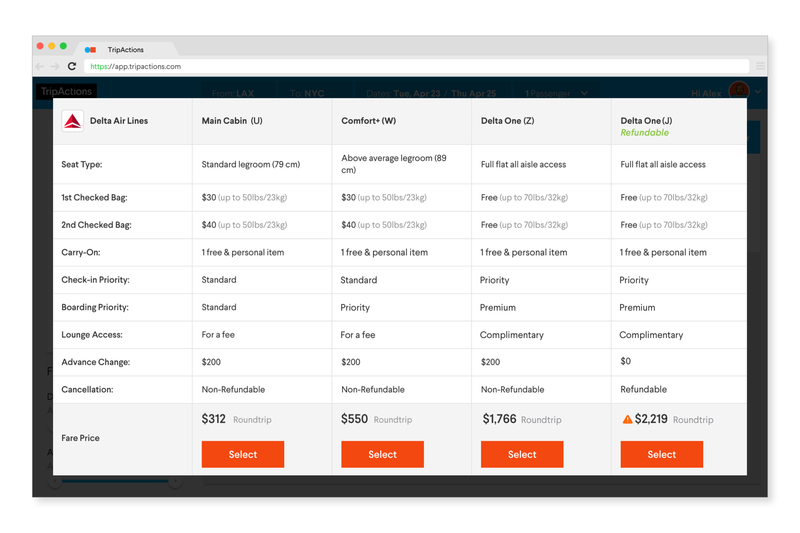 “United was one of the first airlines to partner with TripActions, and we commend them on their efforts to provide customers with far more information about our full range of fare types, products and services in its innovative new booking experience." We’re grateful for the support of our airline industry partners and look forward to continuing to collaborate with them to push the business travel industry forward. 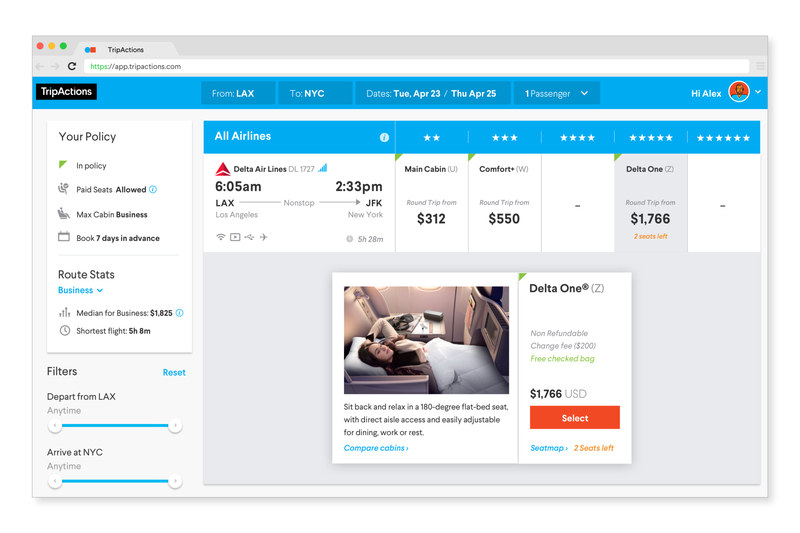 This new standard for booking flights is a critical milestone on our journey to deliver the best user experience available in business travel. But it’s just the beginning — as we take off, we look forward to making this flight booking experience even stronger in the weeks ahead in partnership with our customers and supplier partners. So sit back, relax and enjoy the flight – we’re thrilled to have you on board! Are you a supplier interested in learning more about this new booking experience, ATPCO and how star ratings are designated or how to optimize your content on TripActions? Reach out to our supplier network team at https://tripactions.com/suppliers/.